Air strikes carried out by Saudi-led coalition forces in Yemen have targeted schools that were still in use, Amnesty International has said. The rights group accused the coalition of violating international law and disrupting the education of more than 6,500 children. It said the US and UK should suspend the sale of arms used in such attacks. The Saudi-led Arab coalition intervened in Yemen in March against Houthi rebels who toppled the government. 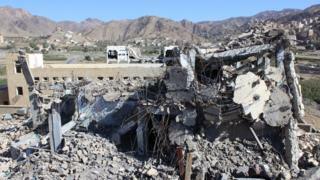 Saudi Arabia has previously denied that it targeted civilian infrastructure. In its report, Amnesty International cited five air strikes between August and October this year on schools in Yemen, which it said killed five civilians and injured at least 14 people, including four children. Pupils were not in the schools at the time of the strikes. More than 1,000 schools have either been destroyed, damaged or are occupied by displaced people, according to data from the Sanaa-based Ministry of Education released by Amnesty. "Deliberately attacking schools that are not military objectives and directly attacking civilians not participating in hostilities are war crimes," said Lama Fakih, a senior crisis adviser with the group. At least 34% of Yemeni children have not returned to school since the conflict escalated in March, according to Unicef. Amnesty said the attacks on schools highlighted "the urgent need" for arms suppliers, including the US and UK, to suspend the transfer of weapons being used against civilians by Saudi Arabia and other coalition members. These include bombs, fighter jets and combat helicopters, Amnesty International said. It called arms transfers "appalling" in light of evidence of international law violations in Yemen by coalition forces. A UK government spokeswoman said it took reports of alleged air strikes on schools "very seriously". The British Ministry of Defence flagged up allegations of international humanitarian law violations to Saudi Arabia, the spokeswoman said, adding that the UK "received assurances that they are complying" with those laws. UN-sponsored peace talks on Yemen will take place in Switzerland next week. Amnesty has called for an independent investigation into the air strikes.